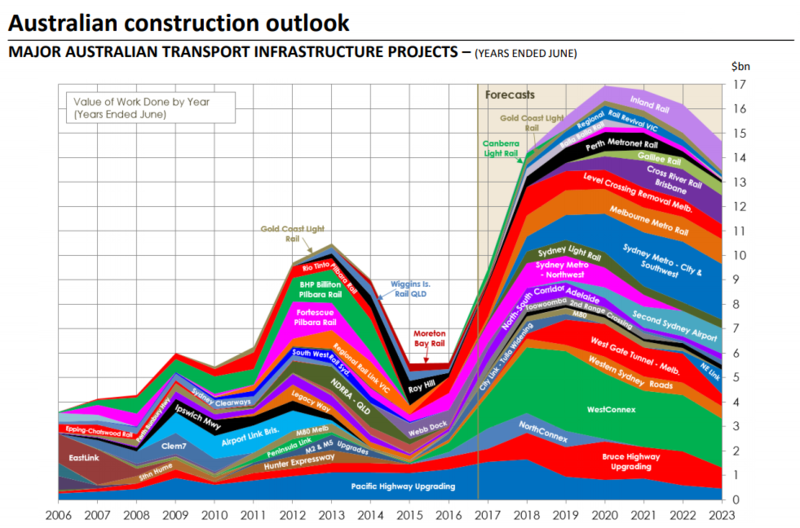 Almost 12 months ago, we published an article about the coming boom in Australian infrastructure spending. At the time, a popular chart by Macromonitor (see below) was being passed around among fund managers and economists showing the massive increase in spend over the coming years. While a combination of stock-specific factors and global market volatility have ensured that share price performance of the major exposed stocks have remained subdued, at a industry level, the theme remains alive. In fact, a recent update to the chart from Macromonitor (see below) shows that peak infrastructure spending is now two years later, and 40% higher than previously expected. As these new projects are awarded and analyst forecasts updated, this creates a real possibility of upgrades to the successful companies. What is the role of changing expectations in driving investment returns? What are the macro implication of this heightened spending at a time when residential housing construction appears to be rolling over? Who are the beneficiaries of this spending, and are they attractive investments at current prices? To better understand these questions, we recently reached out to two infrastructure specialists. Comments have been provided by Peter Meany, Head of Global Listed Infrastructure at Colonial First State Global Asset Management (CFSGAM); and Aaron Binsted, Portfolio Manager/Analyst, Lazard Australian Equity Team. It’s hard to overstate the importance of construction to the Australian economy. In the years since the GFC, the rolling booms, first in mining construction, then in residential housing, have been major factors in Australia’s avoidance of a recession. However, with the residential market apparently rolling over (see chart below), and the possibility of a sustained downturn in construction, a question looms over the Australian economy. Where will the ~900,000 employees working in residential construction look for work if the housing work runs out? Aaron Binsted from Lazard Asset Management called the residential property market the “clear and present danger” for the Australian economy. As a result of the housing boom, there’s been a huge increase in construction employment. As a portion of total employment, construction employment was recently at its highest level in a century. Only time will tell if the infrastructure sector can absorb the impact of any downturn in residential construction, but regardless, it appears a net-positive for the Australian economy. If you’ve ever watched the stock market closely as results are announced, you’ve likely noticed some curious behaviour; a ‘good’ result can often be punished by the market, while a ‘bad’ result can see the price rally. It seems counter-intuitive at first, but there’s a good reason for this anomaly: expectations. When times are tough, negative expectations can become so overwhelming that even a ‘not-terrible’ result can be significantly better than what was being baked into the price. Of course, the opposite is also true. Despite the huge pipeline of projects expected to flow-through over the coming years, investors have turned their attention elsewhere. Markets are expecting higher interest rates globally, which has weighed on the infrastructure sector. “Right now, in infrastructure, the market is concerned about rising interest rates. Defensive assets should naturally lag growth assets in a rising real interest rate environment. The move in US 10-year Treasuries from 2% to 3% was mostly about real growth. In contrast, a future move from 3% to 4% would likely be about inflation. With prices linked to inflation or better, we would rather own an essential toll road than almost any other asset in the market,” Peter told us. “We want our team to come up with an independent valuation rather than simply anchoring to consensus and chasing the market up and down. We don’t think that is a great strategy for wealth creation. “I recall conducting analysis on a car parts manufacturer as a junior analyst and not being able to understand why it was trading on such a low multiple. At the time, the global economy was growing, and car volumes were fine. Consensus earnings looked rosy for the years ahead. Was this a rare free kick? With any spending boom this size, there will always be companies set to benefit. That doesn’t necessarily mean they’re a great investment though. As you’ll see from the two stock discussions below, sometimes a stock with a tailwind can be a good investment, and sometimes it doesn’t stack up. Transurban (ASX:TCL) is driving a number of the key infrastructure projects in Australia. The toll road projects in Melbourne, Sydney and Brisbane will add significant capacity to congested corridors and should lead to faster, safer and more reliable trips for people and goods. In turn this should lead to higher earnings power for Transurban investors. No project (or investment) comes without risk. Large-scale construction may incur engineering challenges or skilled labour shortages, causing delays and cost over-runs. Communities may challenge the location or scope or even the need for the project. Traffic forecasts may not meet expectations. Transurban has committed $6bn over the next 5 years to deliver its share of $15bn in project spend, requiring a significant call on debt and equity capital. As investors we earn a return for taking calculated risks. Fixed price – fixed term contracts help to mitigate construction risks. Transurban has a good track record of forecasting traffic and managing community relations and their social license to operate. Equity dilution is now captured in the price. For Transurban, the market is concerned about the size of the bid for WestConnex. We acknowledge Transurban paid a full price to cement its presence in the Sydney market. Similar to the 2015 acquisitions in Brisbane, we expect the stock to recover once the large rights issue is digested and further details on cost control, debt structures and future connecting projects come to light. The market is also concerned about project delays, due to politics on West Gate Tunnel or construction on NorthConnex. We believe anyone who has endured a peak-hour crawl on the West Gate Bridge or Pennant Hills Rd sandwiched between two semi-trailers will understand the value of these projects. With these key risks discounted into Transurban’s valuation, investors should have greater confidence in future returns. Transurban offers exposure to high quality urban toll roads with limited economic sensitivity and pricing linked to inflation or better. In a global context, the company has long-term concessions in countries with low political or regulatory risk and robust legal systems. Management and the Board have executed well and understand the need to balance medium-term cash flows with long-term value creation. With a sustainable yield of 5% growing at 5-8% per annum, Transurban is a stock to own through the cycle. 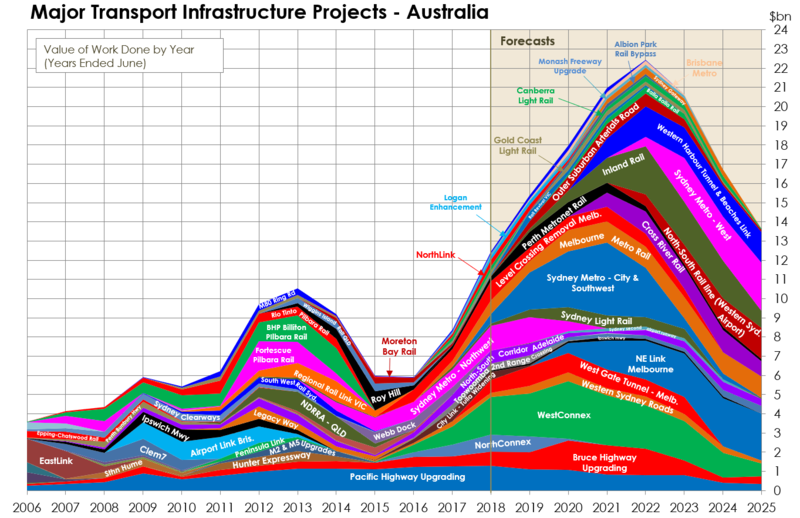 Infrastructure spending in Australia is increasing substantially which will mean increased revenues, profits and share prices for companies exposed to this thematic is undoubtedly an attractive investment story. Yet, the reality is unfortunately much more complicated. For example, Lend Lease (ASX:LLC) is a leading tier one engineering business in Australia with more than $4 billion of work in hand. An investor may conclude that large growth in Australia’s infrastructure spend should lead to skyrocketing revenues for high quality engineers and therefore Lend Lease shares. In reality, engineering is part of the construction division which earned only 24% of Group EBITDA in 2017. Investments in property assets and funds management were much more material to the Group at 36% of EBITDA. Infrastructure might be growing, but what about office building cap rates? And, in 2018 construction was actually loss making due to weakness in its blue-sky division, the engineering business. In this line of work, troublesome contracts can eat away your profits and comfortably neutralise any revenue growth. We do not currently own Lend Lease in our Select Australian Equity Fund, but we are not overly bearish on the stock. The key point here is that, in our view, a stock needs much more than an attractive thematic story to make it a compelling investment.